ESO’s Very Large Telescope (VLT) at the Paranal Observatory in Chile. The stellar backdrop includes the bright star Alpha Centauri, the closest stellar system to Earth. In late 2016 ESO signed an agreement with the Breakthrough Initiatives to adapt the VLT instrumentation to conduct a search for planets in the Alpha Centauri system. Breakthrough Initiatives, a private organization that's dedicated to looking for life elsewhere in the universe, has enlisted the help of a massive telescope in Chile to search for planets around one of the nearest star systems to our sun, officials announced today. Earlier this year, scientists announced the discovery of a potentially rocky planet orbiting the nearest star to the sun, Proxima Centauri; the planet orbits in a region where its surface temperature might be right to host liquid water. The discovery has created excitement about the possibility of finding more potentially habitable planets in our cosmic backyard. Despite its proximity to Earth, detecting planets in the Alpha Centauri system is a challenge, primarily because the brightness of the system's two larger stars — Alpha Centauri A and Alpha Centauri B — overwhelm the light coming from any orbiting planets, according to the statement from ESO. The new agreement between ESO and Breakthrough Initiatives will upgrade an existing instrument on the VLT, making it better equipped to search for the faint light of exoplanets. 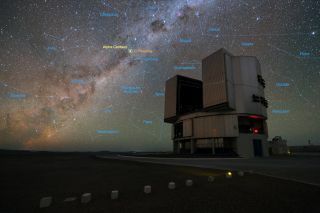 The VLT consists of four primary 8.2-meter telescope and four auxiliary 1.8-meter telescopes, making it "the most advanced visible light telescope in the world," according to ESO's website. An instrument called the VISIR (VLT Imager and Spectrometer for mid-Infrared) instrument — which, as the name suggests, collects light in the midinfrared range — will get an upgrade under the new partnership. The upgraded VISIR will be equipped with a coronagraph, which is used to block out starlight. The instrument will also receive an adaptive optics system, which is used to correct for distortions of the starlight that arise in Earth's atmosphere. In 2019, when the upgrade is scheduled to be completed, the VLT will dedicate time for a "careful search" of the Proxima Centauri system. Founded in 2015 by entrepreneur Yuri Milner and his wife, Julia, Breakthrough Initiatives aims to "explore the Universe, seek scientific evidence of life beyond Earth, and encourage public debate from a planetary perspective." The organization's board consists of Yuri Milner, Facebook founder and CEO Mark Zuckerberg, and astrophysicist Stephen Hawking. Breakthrough Initiatives currently operates three programs: Breakthrough Listen (dedicated to searching for radio signals from an intelligent alien civilization), Breakthrough Message (a competition to send a message to another intelligent civilization) and Breakthrough Starshot, which would use a massive laser accelerator to send microchip-size spacecraft to the Proxima Centauri star system. Last year, another ambitious program that is aimed at studying planets around Proxima Centauri was announced. Titled Project Blue, the program would launch a small space telescope into orbit (eliminating the blurring effects of the Earth's atmosphere); the telescope would be built specifically to study the Alpha Centauri A and Alpha Centauri B systems. Editor's Note: This article has been corrected to state that the VLT consists of four 8.2 meter telescopes and four 1.8-meter auxillary telescopes, not one 8.2-meter telescope and 4 1.2-meter telescopes.